The actual colon is shorter and straighter than you might believe. It's air insufflation that elongates or twists the intestine. 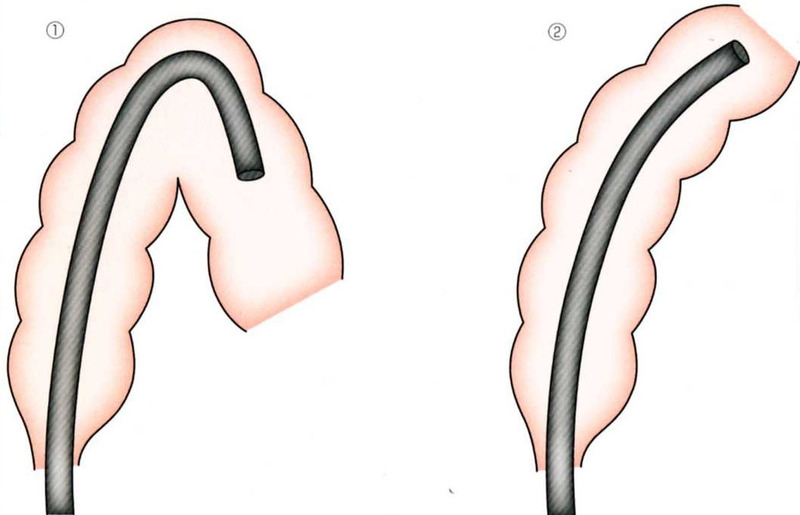 In order to make most out of Water Immersion Technique, which has less friction between fiberscope and the intestine, the most important thing is not to elongate the colon when pushing the scope. Then with a little pull the intestine can be straightened. When pushing does not advance the scope, or pushing straight shows that the colon is elongated, you should not push further. Make sure pushing does not elongate the colon! 1. The colon is straight and shorter than it is in its original position. 2. Insufflation of air or forceful pushing elongates or twists the colon. 3. When pushing the scope, it is most vital not to elongate or twist the intestine. 4. Then it is possible to straighten the intestine with a little pulling the scope. If you push even further there, the intestine will start twisting. You can tell when the view rotates on the monitor. Keep going, and you will make a loop. The knack for not making a loop is to advance the scope straight without giving a twist. If you see the vision starts rotating, you know that the intestine starts twisting, so you should stop pushing the scope and pull the scope instead. 1. Hold the scope softly with your right hand. 2. Advance the scope slowly and straight as you confirm that the scope moves forward as much distance as the scope is inserted. 3. When the view on the monitor starts rotating while you are pushing the scope straight, that means that the intestine starts twisting, so stop there and pull the scope. When pulling the scope straight, the view usually rotates. Then twist the scope to the same direction as the view rotates, trying to stabilize the vision as much as possible. On the other hand, if pulling the scope will not make the vision change, it is a sign that shortening the intestine is successfully done. Keep pulling the scope until the intestine gets completely shortened and the view starts backing away. I will explain more about this phenomenon later in the section entitled Fixed-Point Method. 1. Pull the scope slowly as seen in the monitor. 2. If the view starts rotating, that means that the intestine was twisted. So twist the scope as if following the view's rotation. 3. When the rotation of the view stops and the view starts backing away, the intestine is completely straightened. Stop pulling the scope there and try to find the luminal direction forward. Straightening can be readily accomplished by not elongating the colon to keep its original form and eliminating the twist. Push a little, and if the view starts to rotate, stop pushing and pull the scope instead, as if to try to stop the rotation of the view. And when the view starts backing away by pulling the scope, stop pulling there and push the scope again. The scope can be advanced with this small back-and-forth movement repeatedly. The most important principle not to elongate the intestine is "push straight and pull with twist."